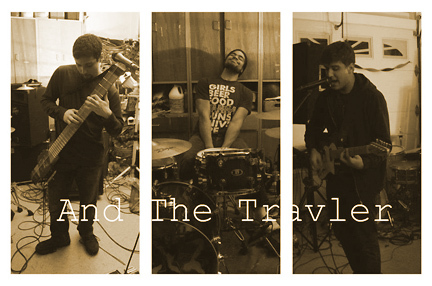 and Max Johl (guitar, vocals) are "And The Traveler"
is available from their online store. Check out more sample tracks at the band's website. Read this online Review of the album. New York progressive rock and jazz fusion trio, And The Traveler, propelled by exhuberent Stickist Josh Goldberg, has just release their debut double CD, and is touring the Northeast this fall. Josh also has an entertaining and informative series of instructional YouTube videos entitled "Stick Science". 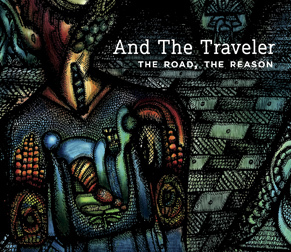 The first thing I noticed about And The Traveller's CD is Josh Goldberg's bass work. If I didn't know he was playing The Stick, I'd swear those fat bass lines were an electric bass. It's not just the sound, but the kinds of lines he chooses, tight unisons with the guitar and Stick melody on the heavy rock tunes, and lots of great fills, and some seriously solid walking on the jazzier tracks, even though he's using a 5ths bass tuning. Josh's melody sounds range from chunky distorted rhythm parts and searing solos to bright clav-like rhythmic punches, carefully interwoven with guitarist Max Johl's insistent electric guitar. -and a Hardwire RV-7 stereo reverb pedal. I get an absolute ton of sounds with these through blending the pedals together and really understanding how each one affects the one before and after it. The one thing I still want to add is an envelope filter for some automatic wah action. The board leads directly into a Roland KC-550 keyboard amp. I like the Roland because it handles the bass well when I switch to mono, and for smaller gigs I only need one amp due to multiple inputs with individual volume control. My bass side is going directly into an Ampeg BR-115. That thing is a workhorse! It's built like a rock, and I can get so many different styles out of it. I love versatility, and that amp definitely has it. Josh likes to share his ideas on exploring the instrument with Free Hands and other techniques through his series of informal "Stick Science" videos. The offer tips for Stick players on a variety of subjects and deliver a healthy dose of Josh's wry, self-deprecating sense of humor. This one deals with strumming chords on The Stick. You can find the whole series on his YouTube Channel. Guthrie Govan, Greg Howe, Matthais Eklundh and Scott Henderson are probably my biggest influences right now. I've also been listening to a lot of 8 string guitar players like Tosin Abasi and bands like Periphery lately. It definitely shows up in how I'm treating the mono function of the Stick. I was a jazz and classical guitar major in college, so huge amounts of both of those styles. My jazz playing has been heavily influenced by my teachers as well. I took lessons for a few years from Jay Azzolina (Spyro Gyra) and Gustavo Assis-Brasil, and both of those guys shine through often. Compositionally I've been really influenced by guys like Chopin, Beethoven, Berlioz and Wagner, just to name a few. I came up with an expanded form of Wagner's leitmotif technique that I've been using to generate a lot of material for the new stuff that And The Traveler is working on. I also have a Bach action figure in my room. And of course video game music. Video game music is probably the ultimate reason I got into playing music in the first place. When done right, it's so descriptive and beautiful. You can see the scene in your mind's eye, even if you've never played the game before. I remember being 11 and playing Final Fantasy 7 in my dad's apartment. At one point, I just set the controller down and listened to the music for a while because it was so incredible. Just recently I got commissioned to compose all the music for an upcoming phone game and this is literally a childhood dream come true. "as a tool to teach myself, and because I didn't notice anyone else really doing it. I figured that if the Stick was to ever be close to as popular as the guitar, it needed to have the kind of informational access that the guitar does, amongst other things. For a little while I thought I was the only person doing that, aside of course from the videos that you (Greg) and Bob have put up. But then I started to notice that other Stick players had similar videos for different topics. They hadn't made a series out of it, they didn't spend their time talking to themselves while wrapping their head in toilet paper or wearing a box to pretend to be someone else, but a lot of the videos had really good lessons to teach anyway. So between the video lessons online, and whatever I can glean from watching and listening to other players, I'll take influence from just about anyone! ".